In Australia, Europe and Asia, most blackjack games will allow you to bet on other players’ hands – even when you are not seated at the table. This is called back betting, and people who use this method are said to be ‘playing behind’ or ‘playing the back line’. Some American casinos also offer this option, but it is much more common outside the United States. A regular blackjack table features a set of empty squares that correspond to each seat. These are the betting boxes, where players put up their wagers for each hand. When back betting is allowed, an active box can hold bets from up to three people. The total amount in any betting box cannot exceed the maximum bet – so if there is a $100 limit and the seated player puts up $40, then any back-line players cannot wager more than $60 between them. The bettor whose chips are placed at the front of the box makes all decisions regarding whether to stand, hit, double down, split, and so on. 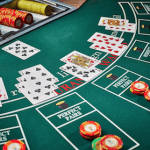 Technically speaking, anyone is allowed to push their bet forward and take control of a hand, but modern blackjack etiquette dictates that back-line gamblers should always allow the seated player to make the moves. And that is only fair, when you think about it – how would you like it if you were sitting there with a pair of 10s and some idiot behind you decided to split them on your behalf? One area where many people get confused is whether a back bettor must follow the controlling player’s every move during a hand. The quick answer is no, they don’t have to. The full explanation is a little more complex. The back-liner holds no power when it comes to drawing cards – so on calls like hit and stand, they can’t do anything. But when there are additional bets involved, as is the case when you double down or split a pair, certain options become available. This is due to the possibility that the person playing behind might not have enough money to cover the extra wager. If the seated player decides to double, the back bettor has two choices: follow along and stump up the additional bet, or opt out of the wager. If the back-line player decides not to double their bet, they remain active and will receive a payout on their original wager if the hand wins. There are also options when the seated player decides to split after being dealt two cards of equal rank. The back bettor can mimic the controller and bet on each of the split hands, or they can choose to play just one of the new hands without putting down any more money. This has no impact on the player in charge, as they play both hands (and any subsequent re-splits) as normal. One of the challenges in betting behind is knowing what to do when the front player makes a glaring error, especially when splitting. For example: the seated player decides to split a pair of 10s. This is a terrible move, but what can we do about it? Back-betting strategy suggests that if the dealer’s up-card is a Seven or lower, we should put down another bet and play both hands. This may seem like strange advice, but such poor play circumstances by the front player require actions on the back player’s part that simply aren’t catered for in regular strategic play. Deuces – When the dealer shows a Four to Seven, play both hands. If any other card, play one hand. Treys – When the dealer shows a Four to Six, play both hands. If any other card, play one hand. Fours – When the dealer shows a Five or Six, play both hands. If any other card, play one hand. Fives – When the dealer shows a Six, play both hands. If any other card, play one hand. Sixes – When the dealer shows a Five or Six, play both hands. If any other card, play one hand. 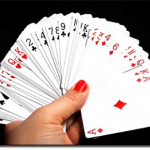 Sevens – When the dealer shows a Four to Six, play both hands. If any other card, play one hand. Eights – When the dealer shows a Seven or lower, play both hands. If Eight or higher, play one hand. Nines – When the dealer shows an Eight or lower, play both hands. If Nine or higher, play one hand. 10s – When the dealer shows a Seven or lower, play both hands. If Eight or higher, play one hand. Aces – Always play both hands. In some games, players are given the option to surrender after the initial deal – this is when you forfeit your hand and half of your original bet, in exchange for saving the other half of the wager. When used, it is almost always a late surrender, meaning the dealer peeks for blackjack before players can take this action. Back bettors can make surrender decisions independently of the front player. For example: if our seated player forfeits, we can continue to play their hand as normal. Conversely, we can also choose to surrender when the controller stays in the round. In both cases, the eventual result has no impact on the surrendering player. So if we sit out and the other guy busts, we don’t lose any more than the 50% portion we already gave up. And if the seated player wins the hand, we get none of the profit. As with splits, this is a useful option that allows someone playing behind to minimise losses when the front player is prone to poor decision-making. For example: let us say we are dealt a soft hand against the dealer’s Seven and the controller surrenders. As this is a bad move according to basic blackjack strategy, we should play the hand as usual, knowing we have a reasonable chance of success. Any Benefits to Back Betting? On the whole, back betting is more often than not, a waste of time and money. Unless we choose to play behind someone who employs optimum strategy and is on a hot streak, the fact we cannot make basic hit-or-stand calls from the back line greatly decreases our likelihood of winning. The freedom afforded on doubles, splits and surrender offsets the disadvantage slightly, but not enough to make it worth the trouble. You would be better served waiting for a seat to open up – or sticking to your own hand, if you are already at the table.